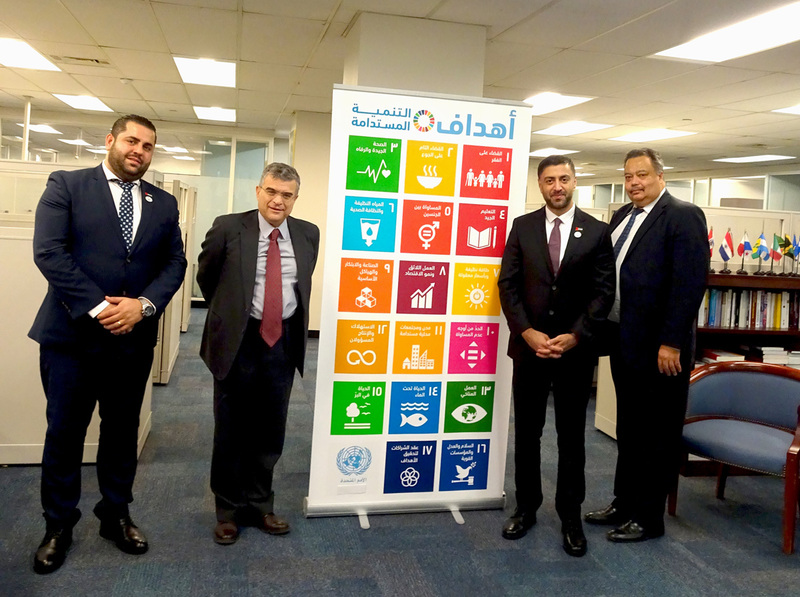 A delegation from the Council of Arab Economic Unity (CAEU) at the League of Arab States, headed by Dr. Ali Al-Khouri, Advisor to the Council, met with the United Nations Development Program (UNDP) in New York to unify efforts for the economic and social development in the Arab world. This follows League of Arab States’ and CAEU’s issuing the first draft of the Joint Arab Strategic Vision for Digital Economy that resulted from the First Arab Digital Economy Conference held in Abu Dhabi last December. The strategic vision includes programs that promote economic and social development in the fields of digital economy. The Regional Bureau for Arab States (RBAS) based in New York serves as the headquarters for UNDP regional programmes and country offices in 17 Arab countries, with the 18th located in the occupied Palestinian territory. The Bureau is headed by Mourad Wahba, United Nations Assistant Secretary General and UNDP Assistant Administrator and Regional Director. UNDP is the UN’s global development network, an organization advocating for change and connecting countries to knowledge, experience and resources to help people build a better life. UNDP’s activities in the Arab States region have emphasis placed on addressing the main impediments to human development in the region and seek to promote and sustainable development for the Arab societies. The joint Arab strategic vision for digital economy promotes economic development programs in the Arab countries, organizes and strengthens economic relations among member states of the League of Arab States, and provides the best conditions for economic growth and the prosperity of the Arab countries ensuring the advancement and improving livelihood of Arab communities. The coordinated efforts meet in the development prospects, common challenges and opportunities for young people in the Arab region as the centre of sustainable development. Wahba welcomed the consolidation of efforts within the framework of creating job opportunities for the Arab youth in the Arab world and supporting the 2030 Plan for Sustainable Development Goals; a high priority for UNDP. Wahba pointed out that “the joint Arab strategic vision for digital economy provides us with a joint plan and agendas to address some of the pressing challenges facing our Arab world, such as poverty, unemployment and political and social instability in some of the Arab states”. “We support many different projects in all regions of the Arab world, and the objectives achieved by these projects can be enhanced and sustained through a unified body within the League of Arab States to guide infrastructure investments for all Arab countries. We welcome this agreement as we have the expertise and the capacity to support the progress and achieve sustainable development in the Arab world”, Wahba concluded in a press statement. Dr. Al-Khouri stressed the importance of the partnership with UNDP to ensure coordination of efforts and to direct grants and investments to achieve the desired impact within the framework of the UN’s sustainable development goals, “we have no choice but to boost digital economies to promote our Arab societies and reclaim our role of contributing to the global economic growth “. The League of Arab States and the Council of Arab Economic Unity are currently coordinating efforts with concerned international organizations, including the World Bank and the United Nations Development Program (UNDP), to hold coordination meetings to support the programs of the Arab digital economy.